Standing desks are great for one’s health and work efficiency, but standing for hours on end can be pretty tiring and you may just need a quick break. That’s why you would be looking for a standing desk chair or stool. With a standing desk chair, you’re guaranteed to find the right position and you can lean back and forth as much as you want, which reduces pressure on your back and knees. If you’re on the lookout for the best chairs that are worth their price tag, you’ve come to the right place. We’ve found the eight most impressive chairs for standing desks. To help you choose which one is right for you, go ahead and read our individual reviews below. The Varidesk VARIChair was made to work well with the company’s own set of standing desks, but that doesn’t mean it’s not as functional with other brands. For one, this is a chair with amazing adjustment features — you can do a complete spin, move to either side and lean to the front or back with ease. The flexibility that this standing desk chair displays is impressive. It’s a perfect choice if you like to move around in your seat at work. 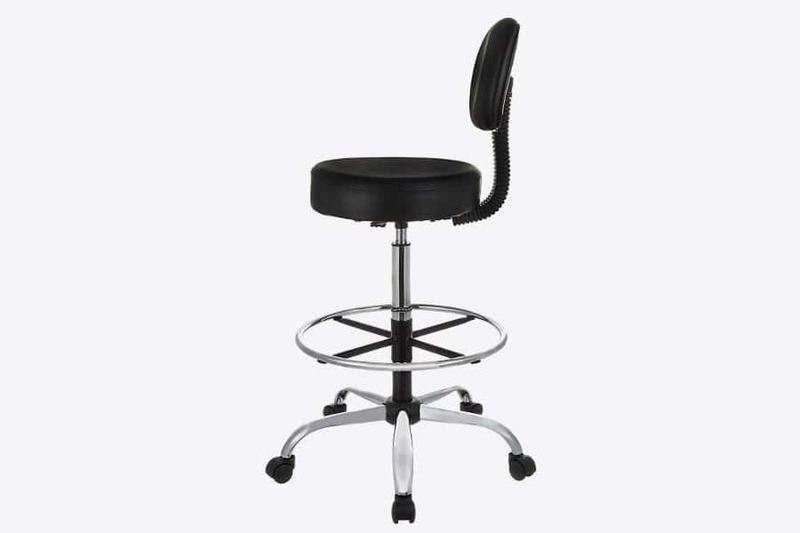 With a conveniently positioned bar on the lower right, adjusting the VARIChair is no problem whether you’re at a low sitting height or higher up. Some users might prefer a lower or higher sitting position, but its adjustment range of 23 to 32.75 inches is already commendable. Also, it’s not so often that people would use their standing workstation at their tallest position. The VARIChair will even go back to its default position the moment you get off the seat. Furthermore, Varidesk not only offers free shipping to 48 US states but it also comes fully assembled. It’s meant for you to use the moment it arrives. You don’t have to prepare a power drill or a few extra screws — all you have to do is get used to the design of the VARIChair. And speaking of design, it’s easy to appreciate the compact yet durable build of this chair. You’ll never feel like you’re about to fall even if you lean far back as long as you rest your feet on the base. If you’re on a treadmill, the VARIChair can comfortably stay beside it in front of a height adjustable desk. There’s no issue with letting the chair stand without anyone sitting on it — its form and its overall weight of 26.31 pounds allow it to remain in place without any support. But what’s great is that it’s not that heavy for a single person to carry the VARIChair on their own. Lastly, this chair encourages good posture with its low-profile back design. It wobbles a bit if you don’t sit properly. Thus, you are forced to remain upright, which is good for your core and your back. This is good not only for your health but also for your productivity. This chair is made to keep you upright, but not everyone is going to be pleased with its hard cushion. The VARIChair should be firm without being uncomfortable. Unfortunately, some feel that it’s too firm to give optimal support while sitting — even for just 15 minutes. In addition, the cushion lacks breathability. There are users who feel that it’s almost like they’re sitting on a substandard bicycle seat. Apart from cushioning issues, we also think that the packaging could’ve been much better given the cost. At present, there aren’t enough protective materials. While the AmazonBasics Multi-Purpose Stool doesn’t come fully assembled like the Varidesk VARIChair, it not hard to assemble either. There are only about five pieces — looking at them alone gives you a good idea of how to put them together. Plus, the instruction manual is easy to read due to the large font size. You also won’t run out of screws since Amazon provides an extra set just in case some arrive damaged. In terms of stability, you can lean forward without falling over. You can reach for things at the back or to the side of the AmazonBasics Multi-Purpose Steel and experience no tipping. Furthermore, its hydraulic lifting mechanism allows you to move up from the minimum seat height of 30.3 inches to 36.2 inches. The mechanism works well all the time — making it a highly reliable chair. You can use this whether you’re at the office, in a classroom, or even if you’re cooking in the kitchen. 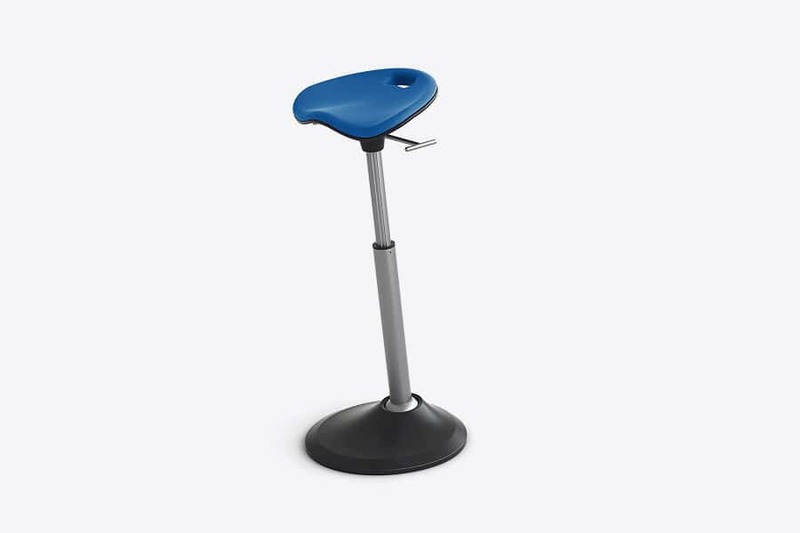 If you want to go back to the lowest height while on the stool, you just have to pull the handle right below the seat; raising the height results in an equally smooth glide. Once you raise the level, your elbows can go slightly above the desk. This allows you to remain upright and see the monitor ahead. And while some chairs for standing desks are too firm to handle, the AmazonBasics Multi-Purpose Stool has found the perfect balance between comfort and functionality. The four-inch cushion doesn’t sink too much and it’s wider than most models. Also, its black, bonded leather is fairly resistant to wear and tear. The AmazonBasics Multi-Purpose Stool dual-wheel casters. Ideally, this helps you move the chair without having to carry it around. The problem is that its movement isn’t fluid. Instead, the wheels are sticky — they stop moving smoothly from time to time. There’s no option to lock the casters in place. The chair can carry up to 250 pounds, but the casters don’t seem like they’re meant for long-term, heavy-duty use. And while we appreciate the considerable height this cheaper chair can reach, its lowest setting isn’t that low for some users. 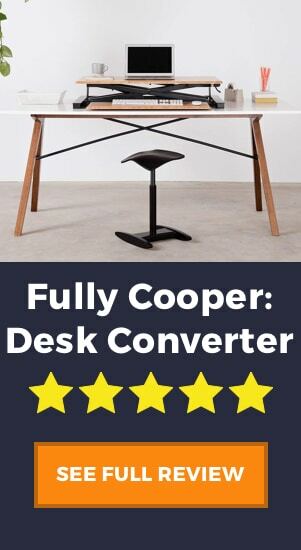 The Varier Move is one of the most customizable chairs for standing desks in the market. For the wood base, you can pick among four options: grey, white, lacquered natural ash, and lacquered black ash. Due to their neutral, contemporary looks, they can easily fit in any office no matter its color theme. Likewise, there are more 17 options for fabric color. The Revive textile is fully made of recycled polyester — a plus for an environmentally conscious option. Under this textile are eight colors, four of which are available for online purchases: light gray, pale apricot, turquoise, and black. The Fame fabric is another good choice since it has eight color options, but all of these are only available in stores. There’s also the full-grain leather option if you want the classic black fabric. Consequently, the design of the seat itself is fantastic; it’s clearly made with the stand up desk user in mind. The seat edges are relatively soft. You lower and raise the Varier Move using the gas lift. At times, it gets low enough for you to keep your feet on the floor — resulting in a better posture to relieve tension in your neck and shoulder area. Once you’re done with work, you can hang the chair by its rubber fixture. Moreover, the Varier Move excels in keeping your core and back muscles engaged. Its convex wood base tilts just enough to make you shift your position from to time. 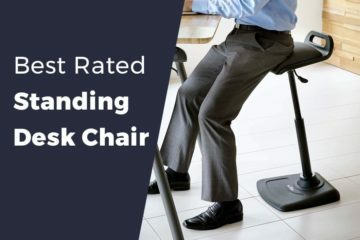 This chair has a NEAT Certification, which means that Mayo Clinic confirmed that its calorie-burning capacity is better than if you just sat all day. If you don’t like the Varier Move, the company offers a full refund if you return it within 14 days after receiving the item. They’ll give you another box in case you threw away the original one. And lastly, Varier offers a seven-year warranty for the wooden parts and a five-year warranty for the mechanism. Nearly everything is great with this chair, except for two things. First, the fabric gets a little too warm at times — it’s lacking in breathability. Second, the cushioning of the Varier Move doesn’t go back to its original form if the user is a bit on the heavy side. The instruction manual leaves a lot to be desired, but that’s easy to forgive — assembling the Gaiam Balance Ball Stool is quick even without any directions. Once fully assembled, you’ll notice how it sets itself apart with its peculiar design. This is all due to Gaia being known for yoga and fitness equipment. Thus, Gaiam designed the seat to take the form of a ball. This is a 45-centimeter wide ball seat that can withstand bursting. But you must still go easy when using the air pump that comes with the package. 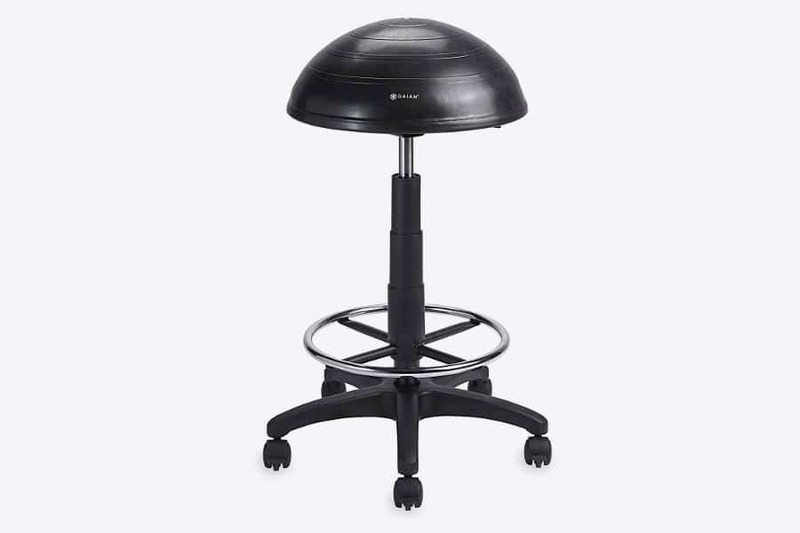 Despite its odd appearance, it works in the same manner as other stools for standing desks. 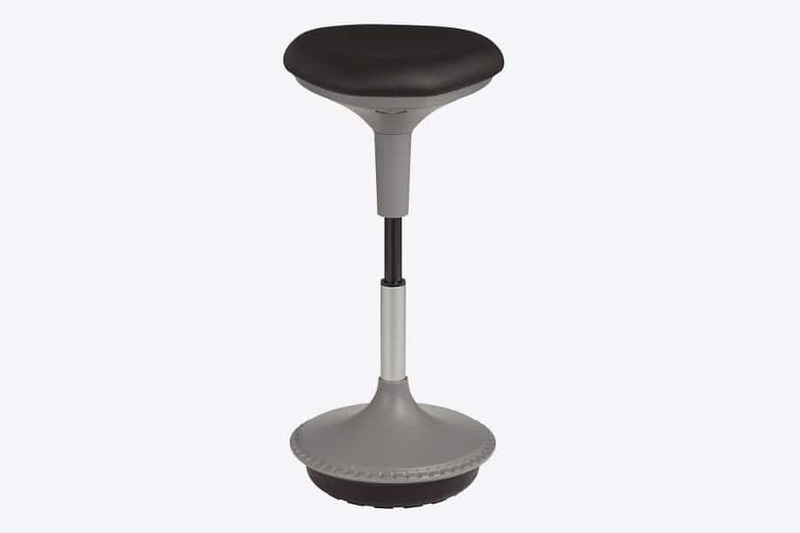 For one, the Gaiam Balance Ball Stool can shift from a height of 18 inches to 23 inches. 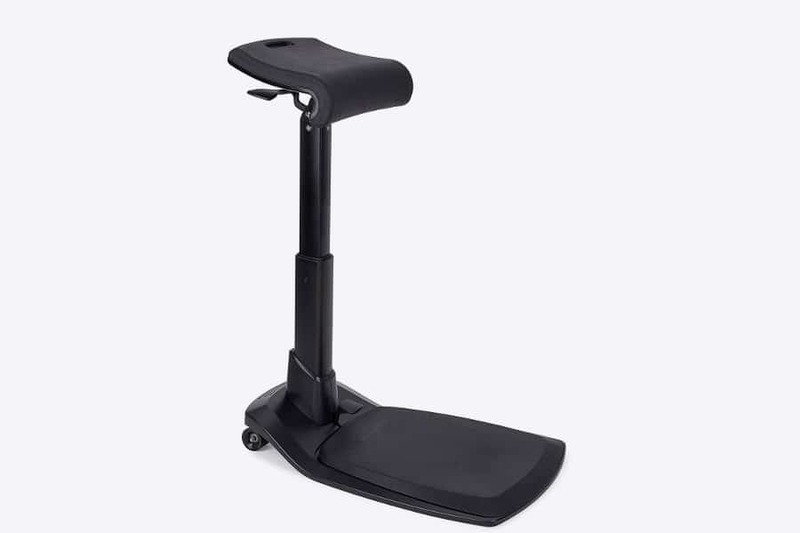 Its lower portion is no slouch either; the swivel base ensures you can rotate up to 360 degrees without falling off. Still, the stool isn’t completely stable — there are very slight movements that encourage you to change positions. Unlike the AmazonBasics Multi-Purpose Stool, this allows you to lock the wheels. They occasionally get locked by accident, but it’s no big deal. Plus, the light casters move in a fluid manner. They glide along with no issues, even when the stool is carrying the maximum load of 300 pounds. The minimum height of the Gaiam Balance Ball Stool could have been lower. If you were to use it with a standard height desk, you can’t just rest your elbows like usual. Also, the ball sometimes loses air too fast, which stops its micro-movements. This affects how well you can exercise your core muscles. Furthermore, it would be better if the ball stool was more comfortable. It’s still too firm to sit on for an extended duration even if we significantly lessen the air inside. The half-dome ball is an intriguing take on a chair for standing desks, but it’s clear that there’s room for improvement. The standing desk chair from Songmics doesn’t come assembled. However, there are no tools necessary to put it together; just insert the poles into the holes and it’s done. This sheer simplicity makes it both durable and stable to a high degree. The 15-inch wide seat is remarkably comfortable despite its medium-level firmness since it’s 2.6 inches thick. And unlike the Varier Move, the padding of this char reverts to its original thickness even under heavy load. The reflex foam has a high-density characteristic that makes it ideal for long-term use. On the other hand, the Songmics Standing Desk Chair remains stable because of its base. Apart from its 16.1-inch diameter, the base features an anti-slip pad that not only resists wear and tear but also keeps the chair in place. You can place it on wood and tile surfaces alike without worrying about it tipping over. You can lean forward as much as you want — its base stops it from losing balance. Likewise, your spine will thank you for using this chair. Its lack of any back support ironically keeps you upright. After all, you have no choice but to correct your posture. If you want to adjust the height, just pull either of the two levels located under the seat. Go from nearly 20 inches before moving up to 27.56 inches. Once you’re done with work, you can just slide it under the desk. Finally, Songmics goes beyond product performance as it also strives for top-notch customer service. Expect a quick and detailed response from them if you send an email. In addition, they are more than willing to send you a brand new adjustable standing desk chair if they can’t find a replacement part. The Songmics has no major drawback whatsoever. But if we had to nitpick, we would’ve wanted more color options. For now, you can only get this chair for standing desks in black. This is in stark contrast to the Varier Move which had 17 different fabric choices. Then again, black never goes out of style. The Learniture Active Learning Stool takes just three steps and a couple of minutes to assemble. And thanks to its polyurethane foam and vinyl upholstery, keeping it clean is simple — a piece of cloth gets rid of dirt and stains with a quick wipe. Likewise, these materials keep the stool light at a mere 26 pounds. You can place it right under your desk if you want to remain standing instead. Plus, its slim profile ensures that you can place the stools side by side around an office table in case of a group meeting. Some might not like the plastic look and feel of the stool, but it’s more than its appearance. Whether you choose a black stool over gray and red, you get a solid seat and an anti-slip base with multiple ridges. In addition, this chair can carry as much as 265 pounds and you can rest your feed around the base. Unlike other chairs, the Learniture Active Learning Stool features a slightly concave, rounded triangle form. This allows you to grab an item without falling over. The spinning motion is flawless and it only takes a few days to get used to it; your back and core will thank you for using a backless stool. 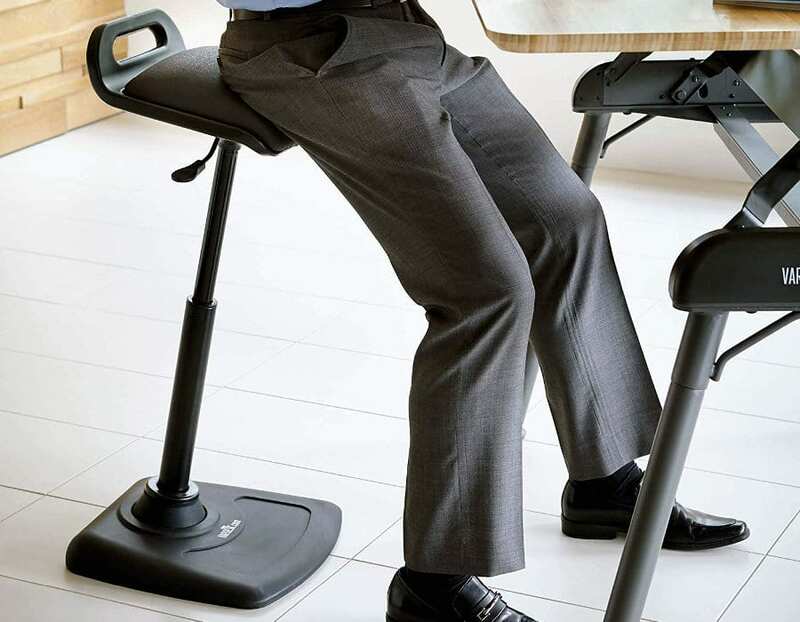 Another unique aspect of this stool for standing desks is that it has more than one button for the lifting mechanism. Each corner of the rounded triangle seat has a button underneath. This way, you can adjust the height from 18.5 inches to 28 inches no matter your current position. The only issue with the Learniture Active Learning Stool is that disassembling it is difficult. Some users have problems with assembling the chair, so they end up with an incorrect setup. In order to remove the parts, you’d have to exert adequate pressure and utilize the base. The instruction manual for the LeanRite Elite isn’t completely accurate, but we assure you that assembly won’t go longer than ten minutes — the package even includes all the tools you’ll need. Upon taking your seat, you’ll understand how it passed the safety and durability standards set by UL and BIFMA. Usually, chairs for standing desks can carry up to around 220 pounds. But with LeanRite Elite, you can comfortably sit and lean forward even if you’re on the heavier side. 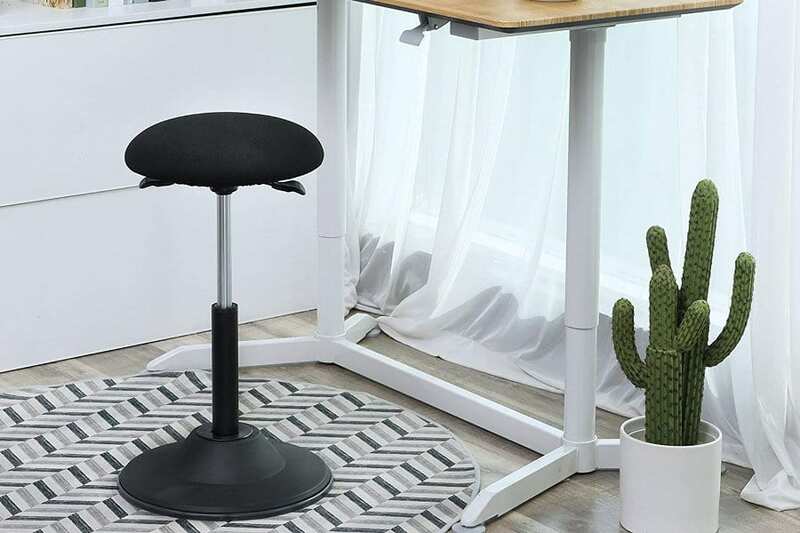 Its 270-pound capacity is perfect for those who have been looking for a stool that can support their weight for the long run. This chair features a backless design to keep your cores engaged all the time. You can lean against your legs or upper back anytime you want — the aluminum frame keeps everything stable. Also, you won’t experience any slips. If you do want to move it around, you’ll find the urethane wheels to be reliable. Arguably the best part of the LeanRite Elite is its anti-fatigue mat. It’s a small platform that’s big enough for your feet to rest. The mat is perfect whether you’re almost standing or you’re at low sitting height. Still, we recommend that you either stand on them barefoot or use a pair of grip socks to avoid slipping. There’s only one major factor why you’d think twice about getting this: it’s expensive. 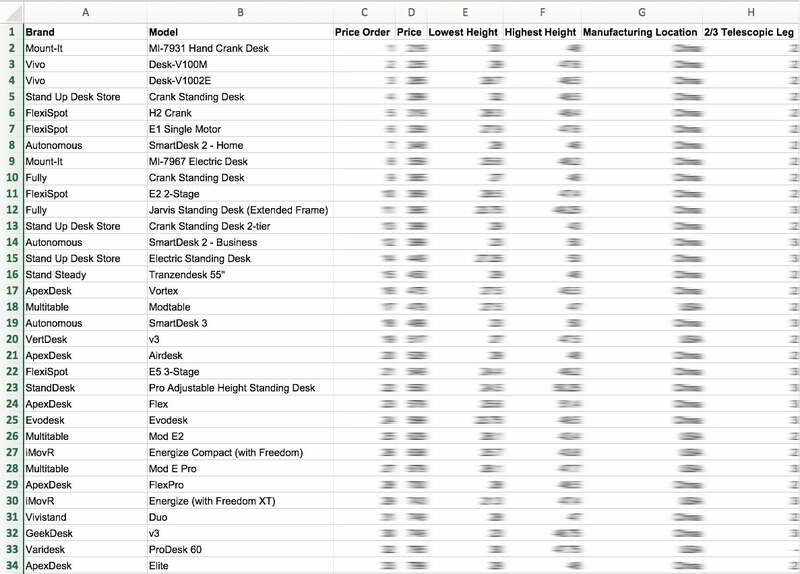 The LeanRite Elite is over $600, which makes it pricier than the average full standing desk. Still, it’s a worthy investment — you get free US shipping along with a 30-day satisfaction guarantee and a limited lifetime warranty. Finally, we have a solid standing desk chair in the form of the Focal Mobis. Like the LeanRite Elite, it’s an excellent choice for users with a large frame — its 300-pound weight limit is well above average. Overall, it seems that the pneumatic support and the base succeeded in terms of durability and stability. In particular, the grip of the base on the surface is superb. This is more the case if your office has a rug or carpet. There’s no reason to fear about the LeanRite Elite tipping over if you perch against it. Also, adjusting the LeanRite Elite is simple — just reach for the built-in handle to get to your desired height. Lastly, the aesthetic appeal is worth nothing. Its compact design looks good in any office and it’s easy to store. 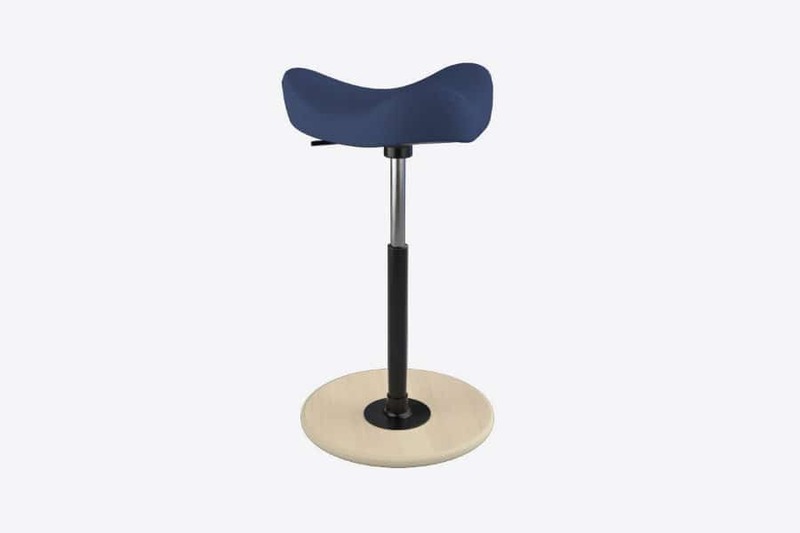 You can use the same stool in any room since you can just take it by the hand. Plus, you have the freedom to move your hips and legs around since the chair doesn’t limit your range of motion. The LeanRite Elite seems to work better when you’re taking a seat than when you’re perching against it. You won’t slip, but you also can’t remain nearly upright with your legs straight on this chair. Still, this is much better than a bar stool if you want to relieve pressure on your back while sitting. Overall, the best standing desk chair is the one that meets your expectations. All of the products we reviewed had their own distinct advantages, but what matters is that you can take full advantage of these benefits. If you’re on the heavier side, consider the stools with a bigger weight limit. Looking for a simple and compact chair for your standing desk? Choose the one with a small footprint and a backless design. Likewise, think of the warranty period, the return policy, and your current budget. 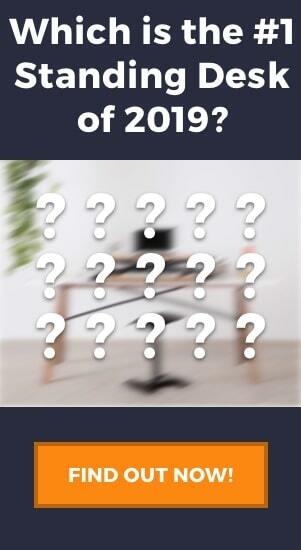 All in all, we hope that this roundup of the best chair for standing desks helped you make an informed buying decision.